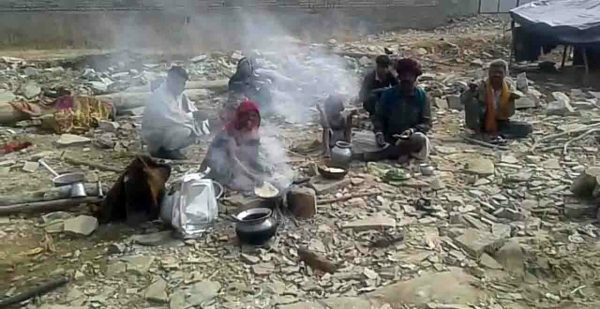 Udaipur : A family of nine persons including four children have been living in the open after their house was pulled down by the village sarpanch on Saturday.The family has refused to move from the place where the house stood and have been cooking and even sleeping in the open on the debris. The incident took place two days ago on Ahirpura road near Laxmipura village in Chittorgarh. The house belonged to one Bhagulal son of Omkarlal Bagriya, head of a nomadic family which earns its livelihood by making and selling brooms. Initially, it was taken as a case of encroachment and authorities didnt give an ear to Bhagulal’s plea when he went to complain about the sarpanch’s act. Later when a fact finding committee was made to inquire about the proceedings, it was known that the house was situated on the municipal limits and hence the Sarpanch has committed an act of ulta vires by pulling down the house which didnt fell in his area. ” Though it is a clear case of encroachment as Bhagulal had encroached on one beegha pasture land near the village. He is a resident of Rashmi tehsil and has a pucca house allocated under the Indira Awaas Yojana on his wife’s name. The village panchayat had sent him notices to clear the encroachment but he didnt pay heed to them. However, since his house was located on the municipal limits, the panchayat had no power to raze down the house. We have served a notice to the gram sachiv” BDO Kailash Baser told Udaipur Kiran. The officer also said that though the encroachment clearing act was legal, however, it should have been done through proper channel as the panchayat didnt have direct rights to pull down a home that was not in their area. It was also known that Bhagulal and his family members are enrolled and beneficiaries under the food security scheme too. Meanwhile, Bhagulal refuses to move from the place. He said” Earlier i lived with my family in Fachar Aheeran a village adjoining Laxmipura. Panchayat asked me to move from the place later in February 2013 the administration allocated a plot on a Bilanam land on Aheerpura road where I made a kutcha house of bricks. I even secured an electricity connection for my home, my application for a patta of the land is pending with the Collector”. On saturday, the village sarpanch Omkarlal Aheer arrived with police team and razed down the structure. Bhagulal and his family members continue to stay there even after their roof was pulled down. They have been living out in the open, cooking and sleeping on road for three days now.